History: The exact origin of the Allergen Gang is unknown. They appear to be artifical imp-like creatures. They were most likely created through some kind of genetic engineering, or possibly through magical means. The Asthma Monster does not seem capable of creating them, and gives no indication he has done anything more than find and assemble them. Each member seems to have been specifically created to spread around a different asthma trigger. 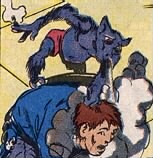 (Captain America: Return of the Asthma Monster)- The Allergen Gang break into prison and free the Asthma Monster, and join him on a crusade to "trigger asthmatic symptons in the entire city in a manner of weeks". 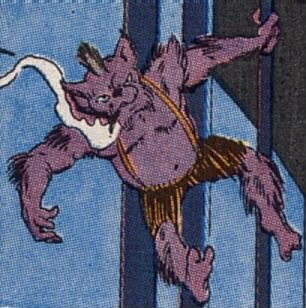 It's implied they knew the Asthma Monster before his first assault. To begin with, they agree to help the Asthma Monster gain revenge on Ruth and John, the kids who put him in prison the first time. BTS- They break in to John's parent's house and set up various traps for Captain America and the kids. Captain America, with the help of John and Ruth defeat the various ambushes set up to impair their breathing created by the Allergen Gang. Specific attacks listed along with each member's entry. The Asthma Monster reforms at the end of this story, but the disposition of the Allergen Gang is left a mystery. The Mold Patrol and most of the Stogies are still free at the end. 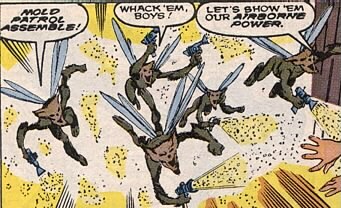 As for the others, I have no idea what prison you'd even send asthma-inducing imps to. Comments: Created by Howard Mackie and Mark Bagley. Ok, ok. I have to admit it. This was the first marvel comic I ever read, waiting in the Asthma doctor's office when I was like 10 years old. So I really love these guys, and just had to do a profile. BTW, I am 90% certain that this is the issue promised to Mark Bagley, as the reward for winning the penciller part of the "Marvel-Try-Out-Book" contest back in the late 80s. They promised that you could pencil a "real marvel comic" or some such. It's certainly his first work for Marvel, and I believe one of his very first professional comic works. Good thing he didn't get discouraged by this, and went on to become one of the definitive Spider-Man artists. And if you're not reading Ultimate Spider-Man and admiring Mark Bagley's current great pencilling there... why not? 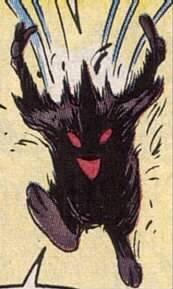 It's also an early marvel work by Howard Mackie as a writer (rather than editor), who just a few months after this would achieve fame for reviving Ghost Rider as Dan Ketch, and a few years later would achieve notoriety for telling some terrible Spider-Man stories. I consider the use of Icemaster from the Hostess Adds a precedent for the potential inclusion of promotional/advertisement characters. Until used, they are right at the fringe of continuity, much like unused Golden Age characters. If not, well, they're fun anyway, and deserve a mention somewhere.--Snood.